2 or more: $75.99 ea. 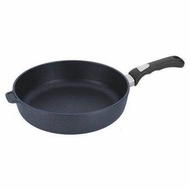 Diamond plus 11 saute pan with no cover. 2.6 high. 3.7QT. The latest styles and designs. Always providing you with the best selection and the best value.